CloudPhysics combines premises software and an online service to help customers track virtual infrastructure usage and performance for infrastructure management, capacity planning, and data center optimization. The new cost calculator, unveiled earlier this month, lets customers compare current private cloud VM costs against public cloud options. Organizations can use these comparisons to inform their private and public cloud strategies. CloudPhysics’ premise is pretty simple: gather as much data as possible about an organization’s virtual environment, and then obsessively analyze and track that data to provide both real-time and historical information about resource usage and performance for VMs, physical servers, storage, and some networking. Here’s how it works. A customer installs a virtual collector appliance that runs inside VMware vCenter, and gives it read access rights to the vCenter API. (At present, CloudPhysics only works with vSphere and vCenter, but it plans to add other platforms). Anything that vCenter can see (for example, VMs and their configurations, physical hosts, CPU and memory use, local disks, data stores, and network dependencies), the collector can also see. Every 20 seconds, the collector uploads reams of information about this virtual environment to its cloud service, where the data is processed, normalized, and poured into a data lake for analysis. Customers get a dashboard view of the current state of their virtual infrastructure, as well as historical views on performance, resource consumption, and other metrics. They can also run queries and analysis to get insights into how their environment can be optimized. For example, historical data could identify over-provisioned VMs. By adding more workloads to existing machines, organizations can defer purchases of new hardware. And because CloudPhysics has access to data from many companies, customers can compare their own performance and resource usage to peer organizations (the data is anonymized). The newest feature from CloudPhysics is the cost calculator. “The number one question from IT is ‘What would it cost us to move to the public cloud, and how does that compare to what we’re paying today?’” said Chris Schin, VP of products at CloudPhysics. 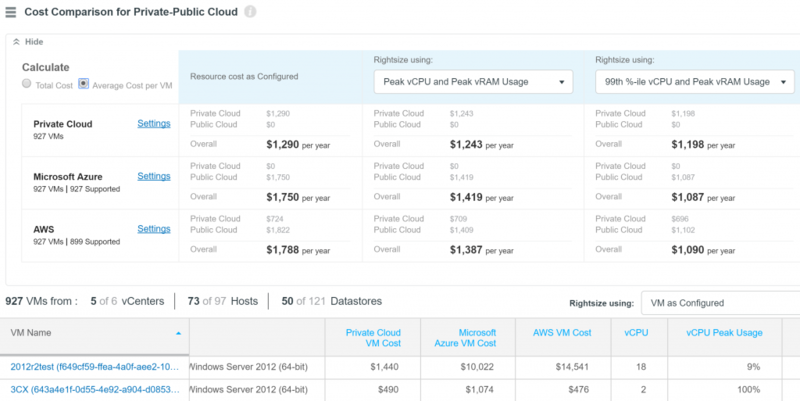 The cost calculator builds a cost profile of a cloud virtual machines, either AWS or Azure (or both), based on the current configurations for workloads running in your data center. The calculator accounts for key information such as CPU, RAM, and image storage, as well as software licenses. “You get a per-VM cost based on the instance it closely maps to, and the sum total per year to move those VMs,” said Schin. Customers can estimate costs on a monthly, quarterly, and annual basis. The cost calculator also includes a right-sizing capability to identify over-provisioned VMs in your data center to help reduce waste on premises and to suggest a more appropriate instance size in the cloud. At present, the calculator only measures the costs of running a workload. It doesn’t account for other cloud costs, such as high availability, disaster recovery and failover, or add-ons for storage, security, and other services. Schin says a calculator with more cost options is in the works. Companies can get CloudPhysics in two ways. One is the premium edition, which is a straightforward SaaS offering sold via the channel. The company also offers a partner edition, which is essentially a one-off service engagement in which a partner deploys and runs the software for a customer for a 14-day assessment and report. CloudPhysics competitors include Turbonomics and VMware’s own analysis and metrics capabilities in vCenter. For a deep dive on CloudPhysics, check out their Tech Field Day presentations from June 2016. Nice write up. Thank you. CloudPhysics has a nice user interface and provides a good way to explore an infrastructure.